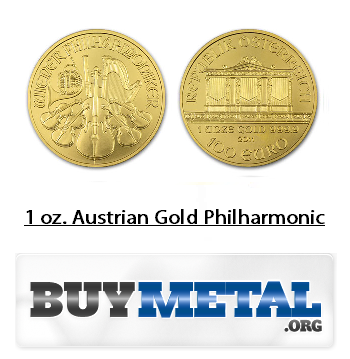 Austrian Gold Philharmonics are commemorative coins that find their home across Europe. As a result of their European origin, each of the coins is marked with Euro designations, ranging from values of 10 Euros all the way up to 100 Euros. These coins are known as Austrian (vs. another country) because they are produced by the Austrian Mint. There are many different types of Philharmonic coins, with each one featuring a unique design that commemorates a different event. Some of the most common Philharmonic issues are the Vienna Philharmonic, the 2008 Europe Talor, and various railway varieties based in Austria. There are virtually limitless designs that can be found on Gold Philharmonics throughout the years. Though they are also produced in silver, these coins are definitely most popular in gold. The 1/10th oz. 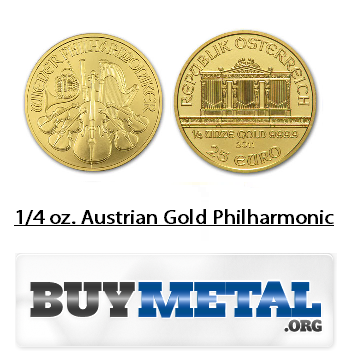 Austrian Gold Philharmonic is the smallest size that these coins are available in, as is the case with the vast majority of gold coins. The coins have a face value of 10 Euros. The diameter of a 1/10th ounce Philharmonic is 16 mm and the thickness is 1.2 mm. The annual mintage for these coins tends to hang around the 20,000-50,000 mark. 1/4 oz. Philharmonics feature lower mintages than their 1/10th oz. counterpart. These coins have a value of precisely 25 euros. Each coin has a diameter of 22 mm and a thickness of 1.2 mm. If you will notice, the thickness of these coins is exactly the same as that of the 1/10th oz. coin. All 1/4 oz. Philharmonics are made of 99.99% pure gold. Half ounce Gold Philharmonic coins are among the rarer versions of this series. Unlike the 1/10th and 1/4 oz. coins, the thickness of these coins is 1.6 mm, making them .4 mm larger than the others. The diameter of 1/2 oz. coins is 28 mm. On these coins, the value is 50 Euros. All coins are most popular and in demand when they are found in 1 oz. 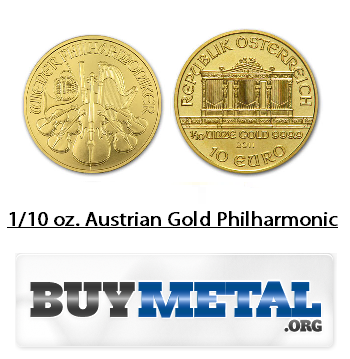 sizes, and the Austrian Gold Philharmonic is no different. These coins are extremely valuable and are a tremendous asset to any collection or investment portfolio. One ounce coins have a diameter of 37 mm and a thickness of 2.0 mm. 1 oz. is actually secondary in size to the 1,000 oz. Philharmonic coin, but this was only issued in 2004 and had a limited run of 15 copies. The face value on 1 ounce Gold Philharmonics is 100 Euros. There are some coins that are much more rare and unique than others, and the Gold Philharmonic is certainly one of them. A coin like the American Eagle is produced in such massive quantities that keep the price and inherent value relatively low, whereas this coin is much tougher to find. Buying these coins is one of the best ways to diversify your collection, whether you are a collector or only into gold for the investment aspect. Buy Philharmonics and reap the long term rewards that go beyond the value of bullion and gold metal alone. There is no disputing that purchasing and ordering Philharmonics online is more of a challenge than finding the more common and popularized coins from around the world. With that said, any sizable company will definitely have a number of copies of this coin in stock. Look and expect to pay a fair amount over spot when obtaining Gold Philharmonics, but consider it a premium on your investment that will pay returns down the line.